A vibrant civil society - characterized by the independently organized activity of people as citizens, undirected by state authority - is an essential support for the development of freedom, democracy, and prosperity. Thus it has been one important indicator of the success of post-communist transitions. This volume undertakes a systematic analysis of the development of civil society in post-Soviet Russia. An introduction and two historical chapters provide background, followed by chapters that analyze the Russian context and consider the roles of the media, business, organized crime, the church, the village, and the Putin administration in shaping the terrain of public life. Eight case studies then illustrate the range and depth of actual citizen organizations in various national and local community settings, and a concluding chapter weighs the findings and distills comparisons and conclusions. 1. Introduction - Laura A. Henry and Lisa McIntosh Sundstrom; The History of Civil Society in Russia; 2. Civil Society in Late Imperial Russia - Mary Schaeffer Conroy; 3. Civil Society in the Soviet Union? - Alfred B. Evans, Jr; The Context of Civil Society Development; 4. Media, Civil Society, and the Failure of the Fourth Estate in Russia - Sarah Oates; 5. Business and Civil Society in Russia - Peter Rutland; 6. Organized Crime Groups: "Uncivil Society" - Louise Shelley; 7. The Church and Civil Society in Russia - Edwin Bacon; 8. Civil Society in Rural Russia - Stephen K. Wegren; 9. Vladimir Putin's Design for Civil Society - Alfred Evans; Civil Society in Contemporary Russia: Case Studies; 10. Women's Organizations: Institutionalized Interest Groups or Vulnerable Dissidents? - Valerie Sperling; 11. Soldiers' Rights Groups in Russia: Civil Society Through Russian and Western Eyes - Lisa McIntosh Sundstrom; 12. Russian Trade Unions: Where Are They in the Former Workers' State? - Sue Davis; 13. Russian Environmentalists and Civil Society - Laura A. Henry; 14. Disability Organizations in the Regions - Kate Thomson; 15. Formal and Informal Strategies of Migrant Populations - Moya Flynn; 16. Public/Private Permutations: Domestic Violence Crisis Centers in Barnaul - Janet Elise Johnson; 17. Is Civil Society Stronger in Small Towns? - Anne White; Concluding Thoughts; 18. 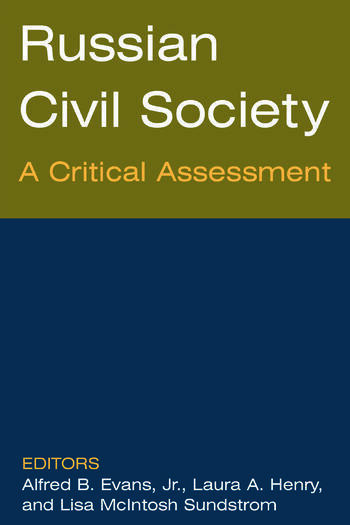 Russian Civil Society: Tensions and Trajectories - Lisa McIntosh Sundstrom and Laura A. Henry; Appendix: Defining Civil Society.